By way of introduction, what is your tagline or elevator pitch? I’m a Visibility Expert who specializes in helping launching lady entrepreneurs get more visible online through branding, video + livestreaming techniques so that they can skyrocket their visibility, monetize their success + finally start changing the world with their unique message. How has your personal journey battling with health issues and depression informed your current brand? Oh my gosh, it’s in every cell of my brand! I was just sitting back from my computer screen last night thinking, “Wow. I could have never created my Life Reboot course to help women heal if I hadn’t so desperately needing healing myself. Or the Branding Course, because my degree in natural medicine totally shaped how I look at color!” As much as going through that ugly period of time of multiple organ failure, depression + chronic headaches was incredibly painful, healing myself naturally + resolving past wounds has 100% made me who I am + 100% enabled me to help other women who are in serious struggle in their life + business! Why did you choose to focus on “ladypreneurs”? I’ve found that female entrepreneurs have the hardest time getting visible in their business – just like I did when I was in tv/film. We tend to hide because of past pain, seeing ourselves as not enough or not worthy of any kind of spotlight. I think we can help people who are exactly where we’ve been, + I know the fear of visibility incredibly well! When it comes to branding and increasing visibility, what are some of the common pitfalls or missteps you see entrepreneurs making? It can be soooo easy, especially when we’re first starting out, to stalk our favorite entrepreneurs + just copy whatever they do, “knowing” it will elevate our brand because it worked for them. What we need to understand, however, is that they are posting that status/challenge/course/video because they took the time to research + feel into what their audience needed to hear, then threw their unique gift into it. THAT’S why it was a hit. So by posting similar things, you’re just not going to get the authentic visible push you’re craving. Everything changed for me (and my brand Visibility Vixen® was born) when I turned everything off, went to a local coffee shop + spent about 30 minutes feeling into the pain + struggle I felt as a stand in – being in front of the camera, but not when it was actually rolling. Then I thought about my tribe, current + future. How did they feel? Just as invisible? In just as much pain? And that’s how I created my Visibility Training Series. You are completely capable of creating something extraordinary by trusting yourself + your life experiences. That’s when really beautiful creations are born! Most female entrepreneurs are pretty strong, resilient, + stubborn (me included). But when it comes to posting on Instagram or Facebook, it’s crickets…because there’s a huge fear of it ‘not being good enough’, ‘looking stupid’ or them being discovered as a ‘fraud’. I put off sending newsletters out to my email list for 6 MONTHS because I was absolutely terrified of unsubscribes! It totally doesn’t make sense, but fear usually doesn’t anyway. No one will see you if you don’t post. That’s how people find you + how you stick in their minds. Don’t worry about it not looking the best – focus on the heart of the message behind the post! That’s what draws people to you the most. Ack! The most dreaded part of visibility – especially going ‘live’. I could bore you all day with livestreaming stats, but the point is – as business owners, we have to embrace current trends. And video (in any form) isn’t going away. If anything, it’s now totally overshadowed text! Don’t be discouraged, just adjust your plan a little bit. Put an intro video above your blog post, put a 1 minute video in as an Instagram post. Introduce yourself to your Facebook Group with livestream. Slowly, you’ll start to embrace it, see how wonderful you are on camera + above all else, how many people you can touch! What’s the one piece of advice you can give to BOTB readers on launching their personal brands? Take your time. And I mean, give yourself permission to really figure out who you are, as a person + as a business, before you launch your brand (vs avoiding branding at all costs because it can be terrifying). I think clarity is key. Throwing out ‘life coach’ or ‘health coach’ is boring. Dig deeper. I remember workshopping with a woman who was struggling with a generic title of life coach – but she loved helping Mom’s with newborns! So I suggested “newborn navigator”! SHE LOVED IT! We took the time to really dig deep into her passion + coin a totally original + catchy name for her. Don’t beat yourself up if it takes more time than you thought. My brand came totally out of the blue! Roll with it + allow yourself to evolve! 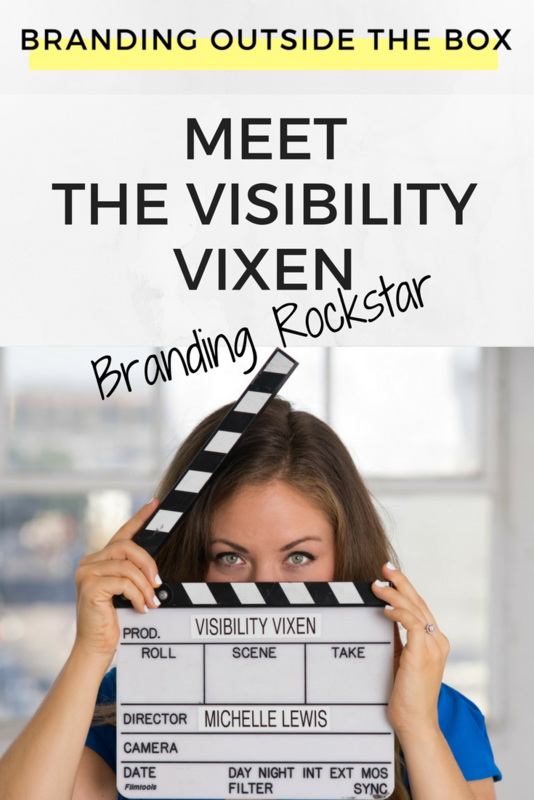 Want more from the Visibility Vixen? Take her free visibility course, join her Facebook group, and connect with her on Instagram!